When the weather is forecast to be outstanding, it is sometimes worth taking a day off work to head to the hills. 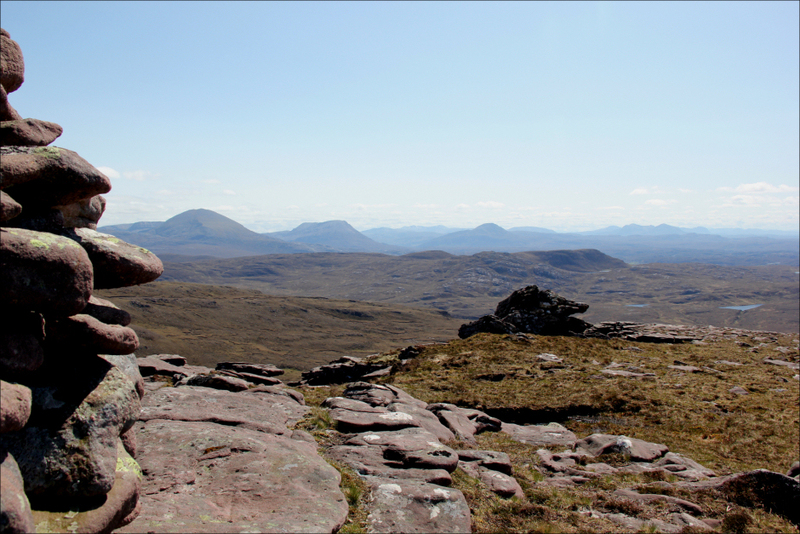 The North-West Highlands forecast for yesterday looked excellent. I therefore booked a last-minute day off work and in the evening began pondering over the maps to come up with a plan. When the weather is great, it is worth doing great hills. 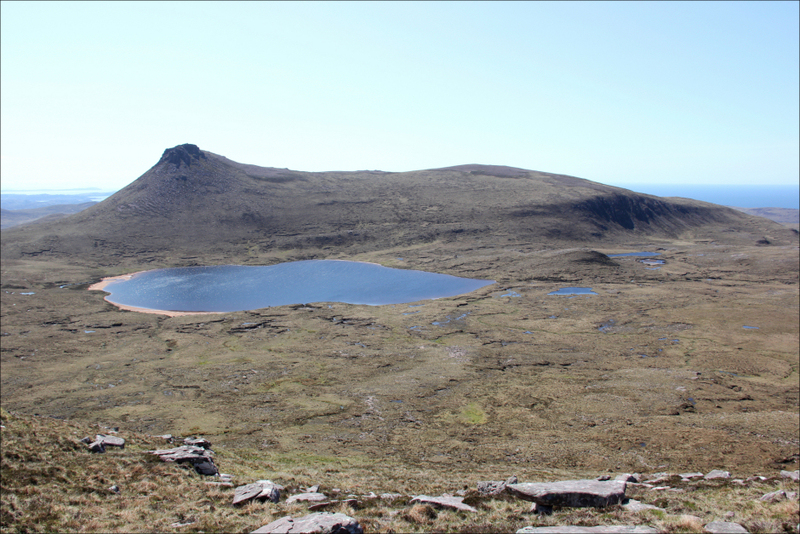 I therefore considered a potential ascent of Foinaven, Arkle, Ben Stack, Quinag, Suilven, Ben More Assynt, Stac Pollaidh and several more of the spectacular hills to be found North of Ullapool. However, I had ascended all of these hills previously and fancied doing something new and a little bit different. 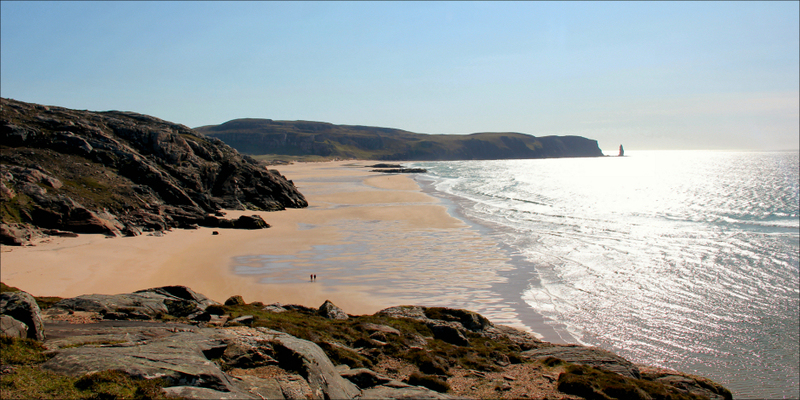 I had always wanted to visit Sandwood Bay and still had two Marilyns to ascend in the Cape Wrath/Parph area. 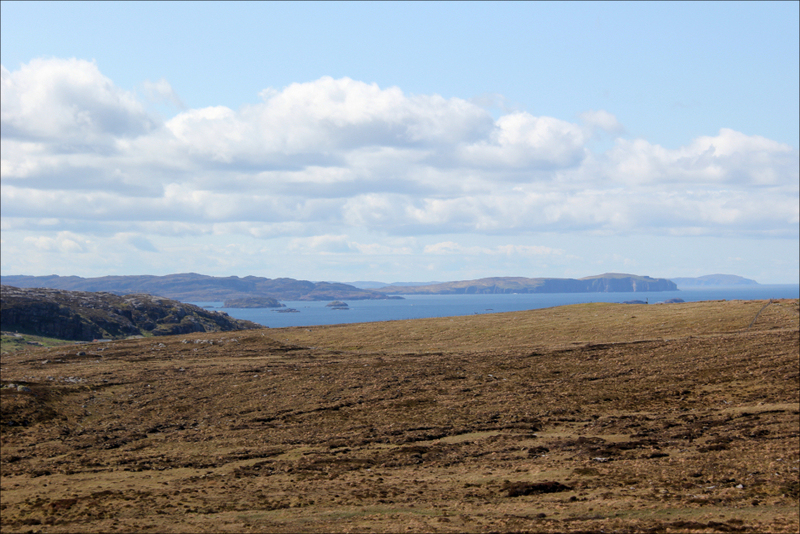 I therefore worked out a route which would allow me to i) visit Sandwood Bay, ii) ascend An Grianan and Creag Riabhach and as a bonus iii) visit Strathan and Strathchailleach bothies. On Tuesday morning, I drove from home towards Kinlochbervie arriving at the Sandwood Beach car park shortly before 11am. On arrival at the car park, I had to decide whether to undertake a clockwise or anti-clockwise circuit. 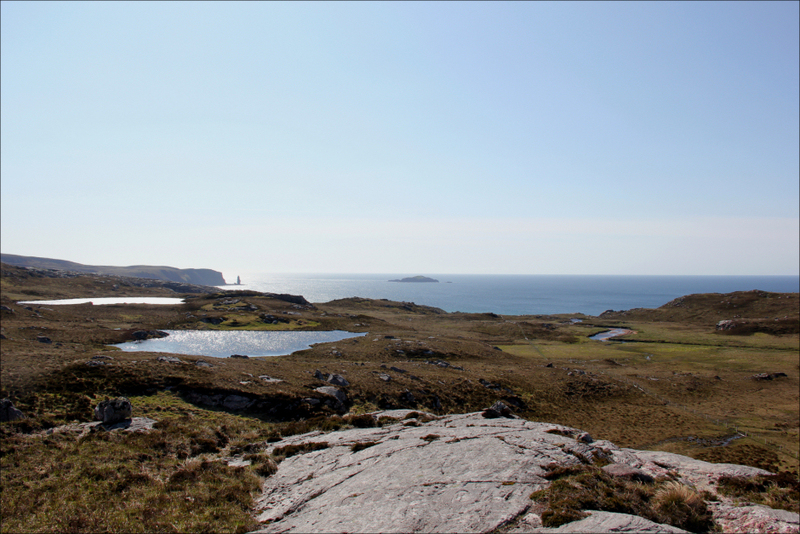 I opted for an anti-clockwise circuit as this would allow me to walk along Sandwood Bay towards Am Buachaille and also visit the bay in the late afternoon when the weather was forecast to be even better. 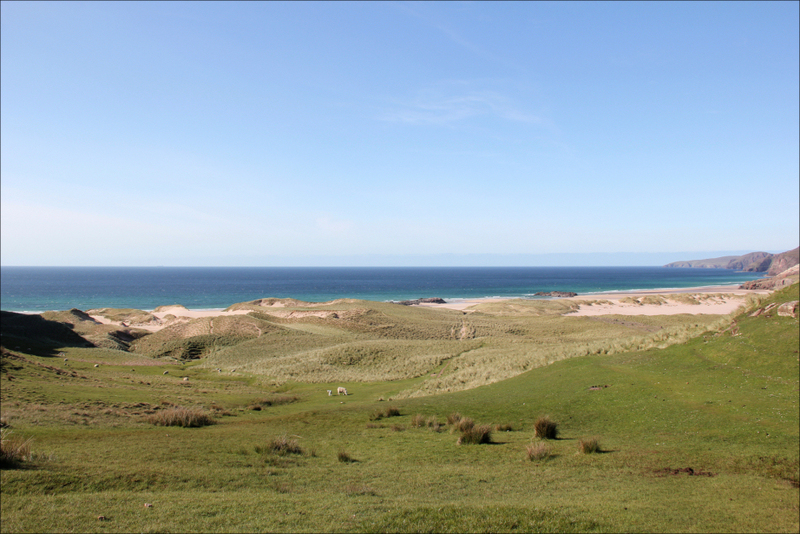 From the Sandwood Beach car park, I walked just over 1km back along the road to reach the start of the track leading to Loch Mor a' Chraisg and beyond to Strathan Bothy. From the outset the views were great. 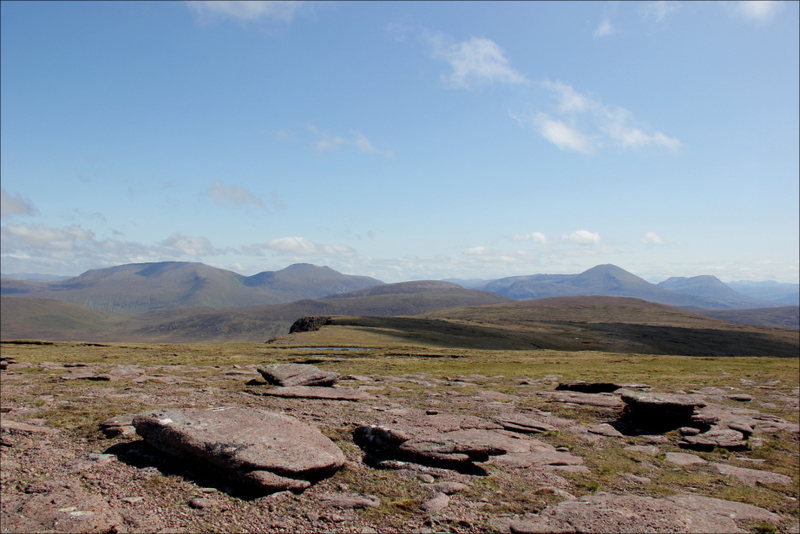 Many of the finest hills in Scotland are located in this area and none of them are Munros. 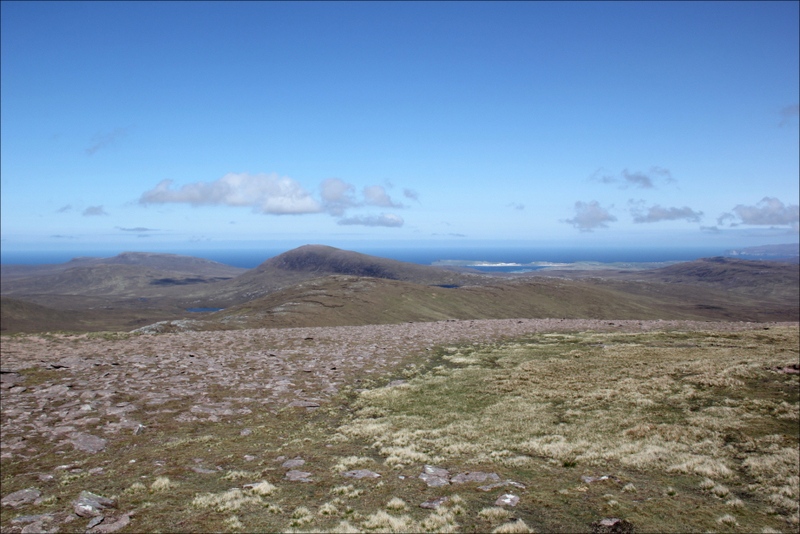 Anyone focusing purely on Munro-bagging is missing out on the wonderful hills in this area. Not only are the hills great but so is the geology. 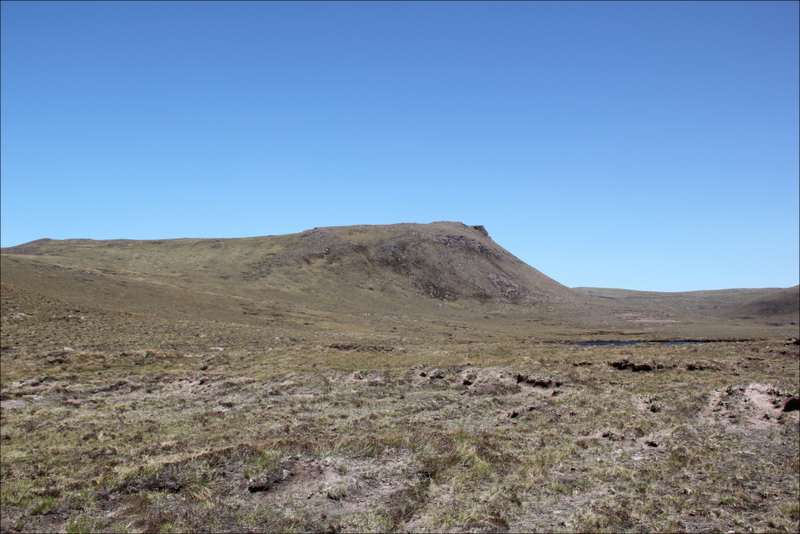 After walking circa 1km along the track, I left the main track to follow a somewhat intermittent footpath leading to Loch Mor a' Chraisg. 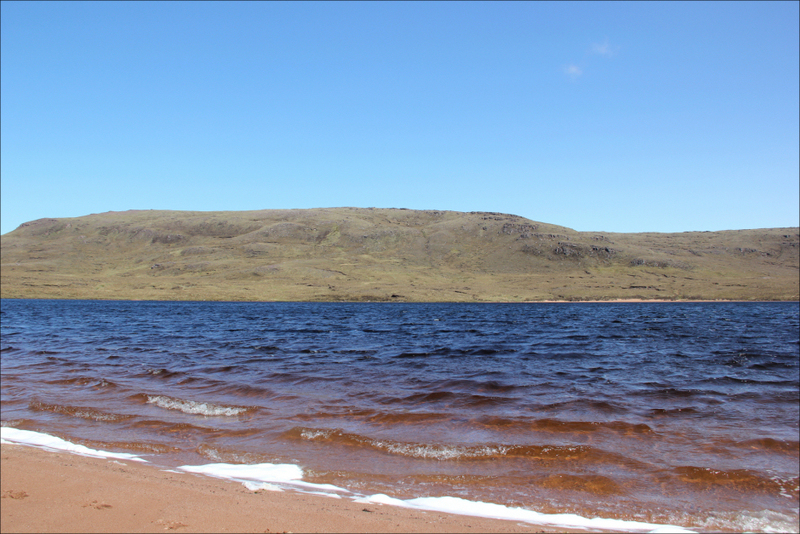 Many of the lochs in this area have nice little beaches. 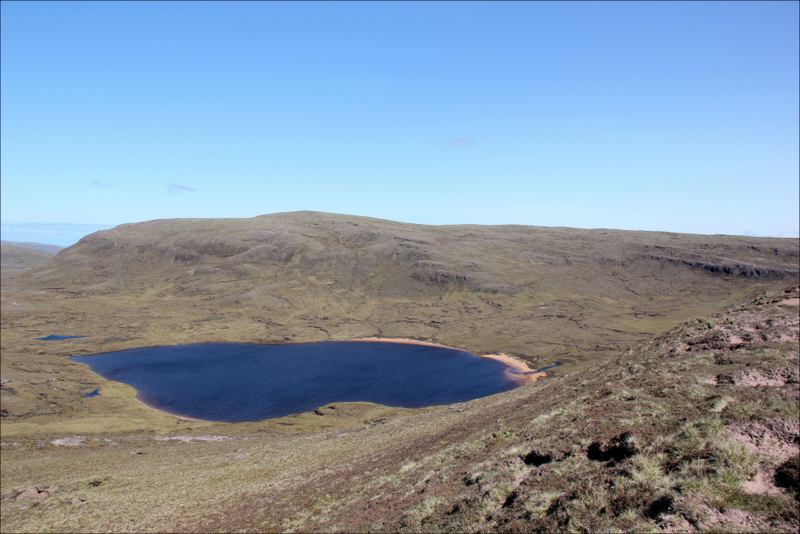 Loch Mor a' Chraisg is no exception. 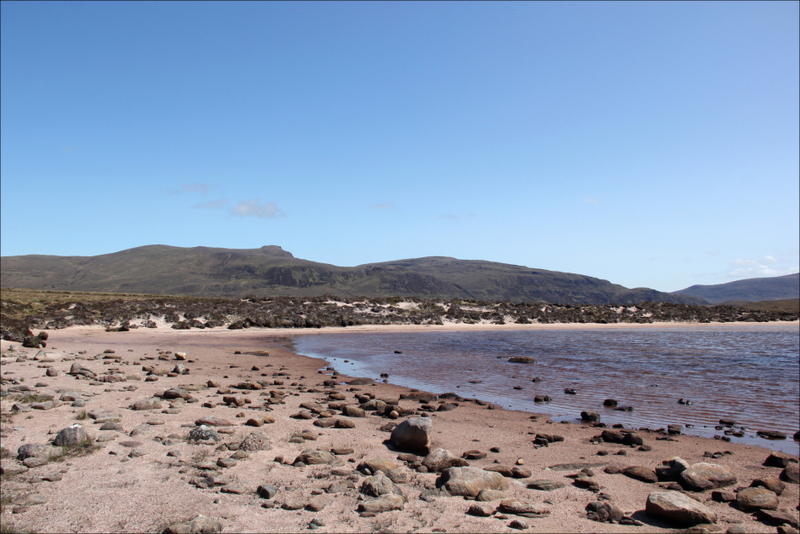 As the path was fairly intermittent, I walked along several sections of lochside beach. Beyond Loch Mor a' Chraisg, the path improved somewhat as it led towards Strathan. As the Abhainn an t-Srathain was not in spate, I didn't bother using the nearby wire bridge. Instead I just walked through the shallow Abhainn. 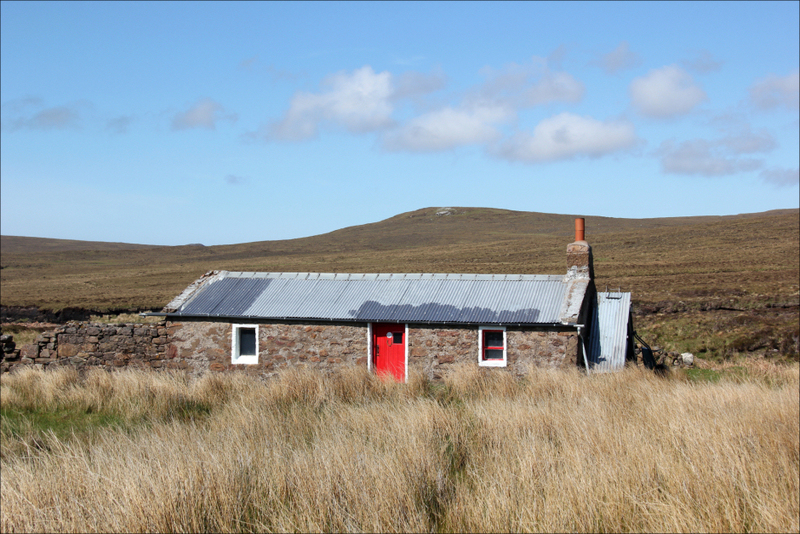 On reaching Strathan Bothy, I spoke briefly with two walkers who were undertaking the Cape Wrath trail. 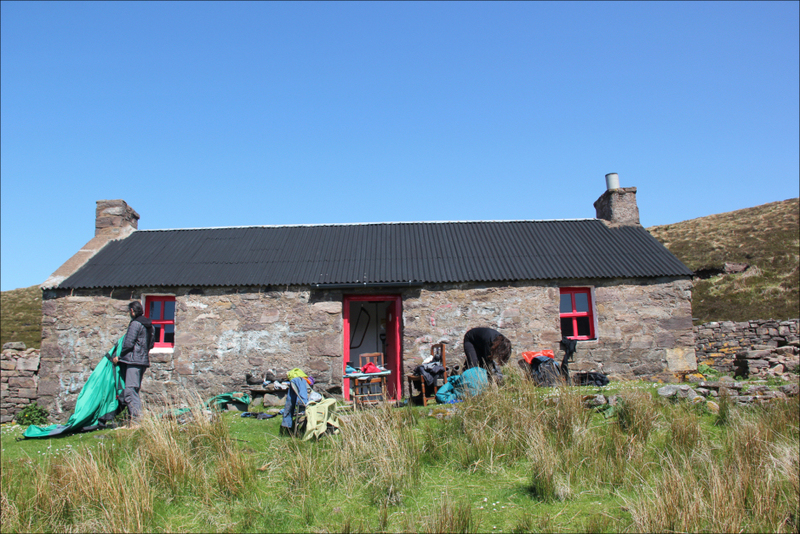 I then took the opportunity to have a drink and re-apply suncream as it was hot and sunny. 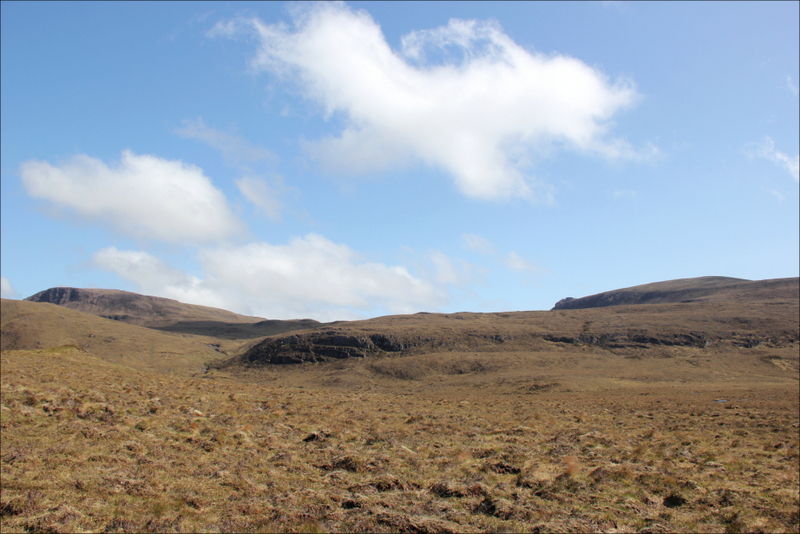 I then began my ascent of An Grianan starting from directly behind the bothy. 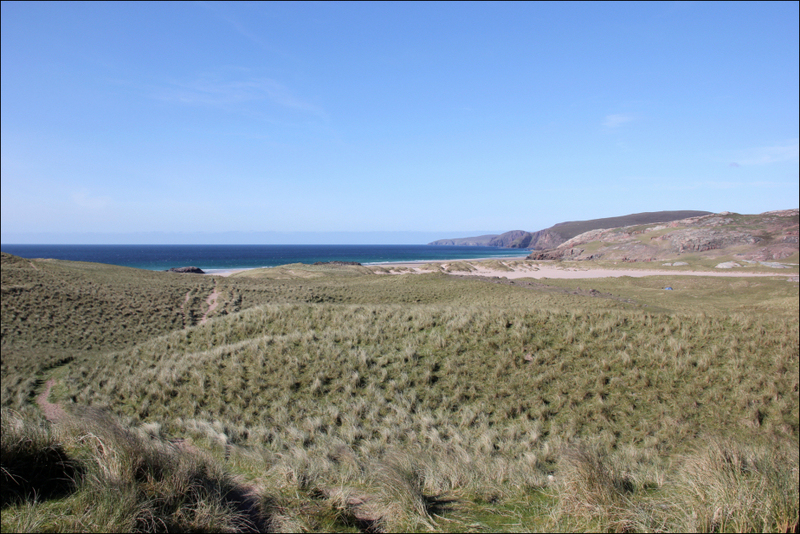 From this point on until reaching Sandwood Bay in the late afternoon, the terrain was entirely trackless. During the ascent of Sron a' Ghobhair and An Grianan itself, I passed several sandstone tors with good climbing potential. I couldn't find any routes listed for these crags on UKC, so these crags may yet need to be developed? 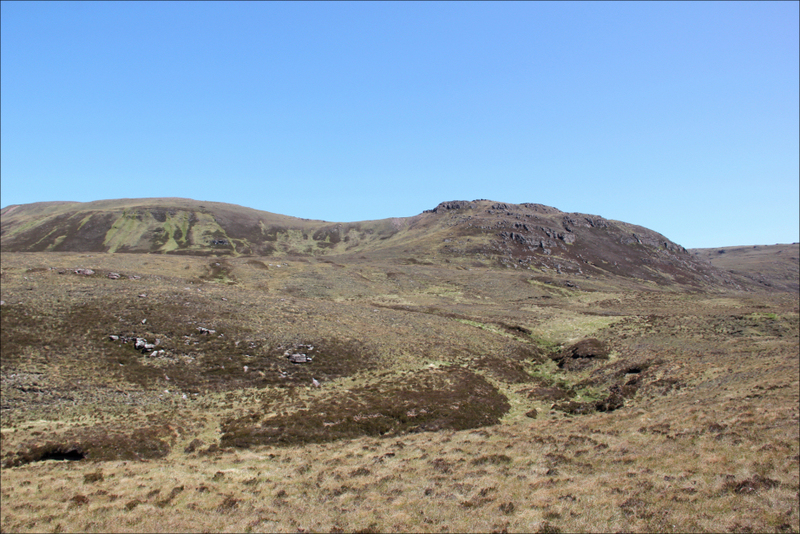 On reaching the rocky summit of An Grianan, I again stopped for another drink and a look at the map before continuing on to Creag Riabhach. The descent from An Grianan was straightforward. Do not descend the steep crag directly! 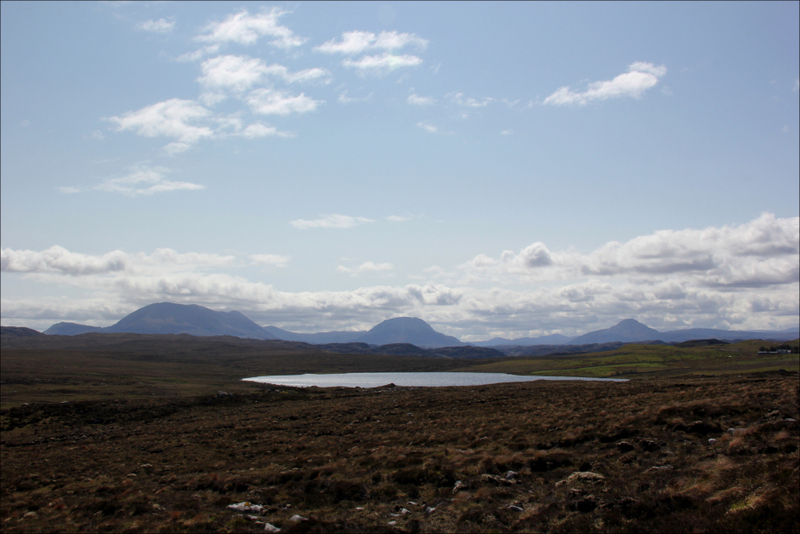 I made my way down to Loch a' Phuill Bhuidhe and then had the choice of skirting the loch clockwise or anti-clockwise. The routes looked about equidistant, so I just opted to "go left". The ascent of Creag Riabhach was nice and easy. 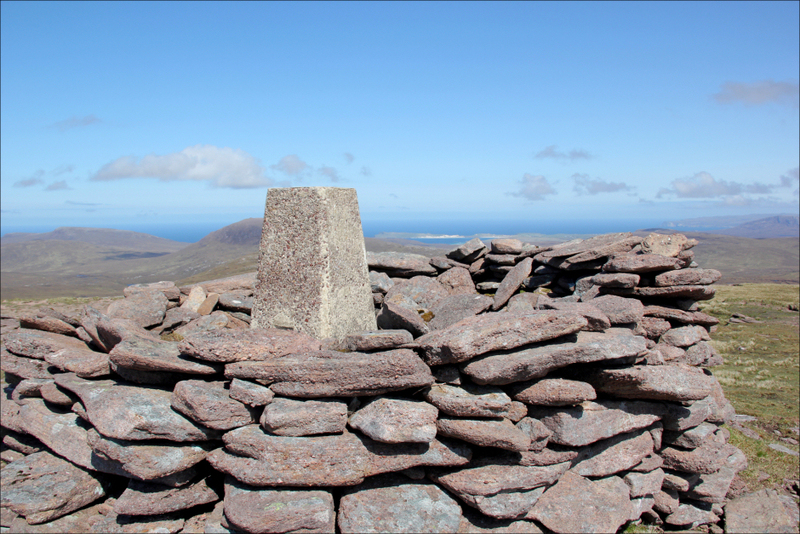 The summits of An Grianan and Creag Riabhach are well marked with large cairn (An Grianan) and stone shelter and trig point (Creag Riabhach). 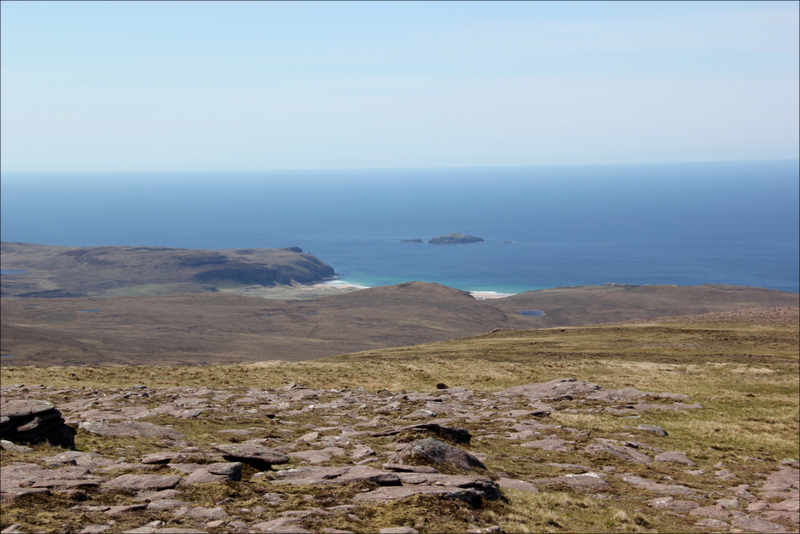 From the summit of Creag Riabhach it was now a case of head in as straight a line as possible towards Sandwood Bay. Given the nature of the terrain following a straight line was nice in theory only. During the descent, I thought I could see a path in the distance so I made my way towards it. It was not a path but was a fairly new fence. This fence was a fantastic navigational aid across flat terrain as it heads all the way to Sandwood Bay. 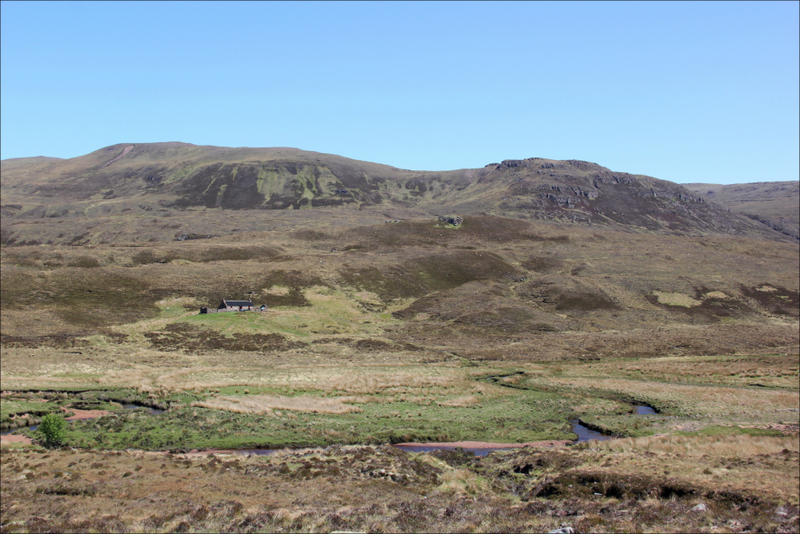 I followed the fence until seeing Strathchailleach Bothy. 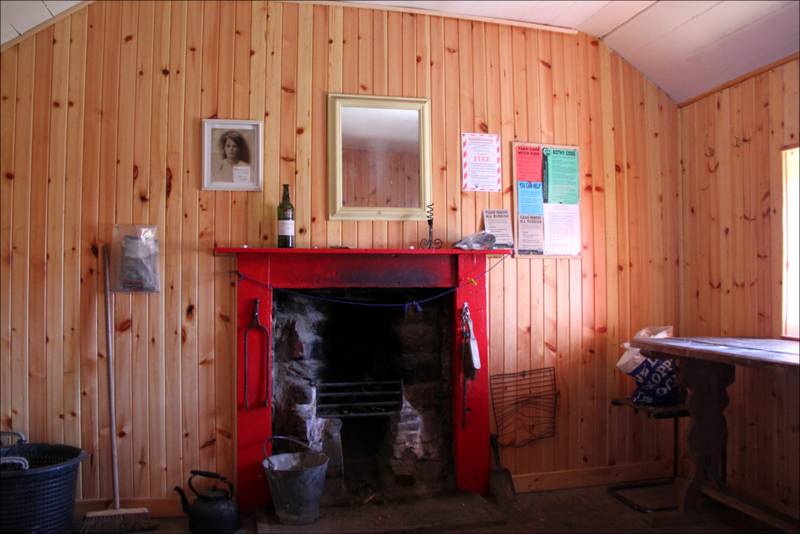 I then took a short diversion to visit the bothy. 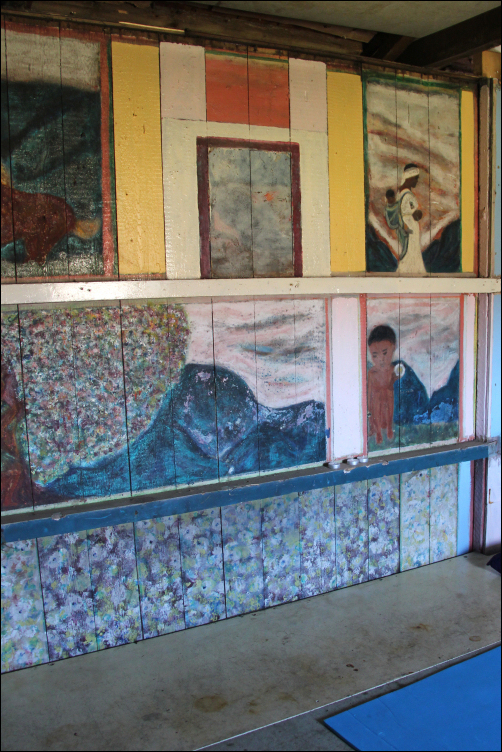 The bothy has several paintings on the inside walls. 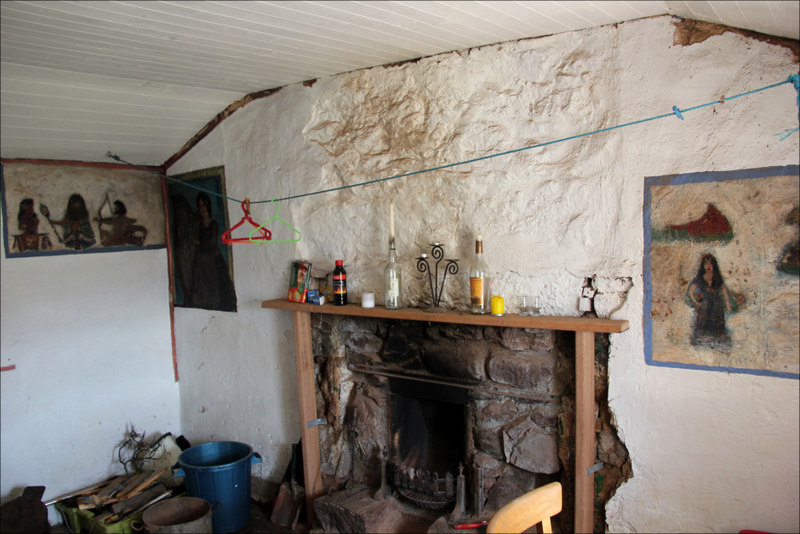 From the bothy, I again headed in the general direction of Sandwood Bay. The ground was very wet in places; it would have been easier had I returned to the fenceline and followed it to Sandwood Bay. 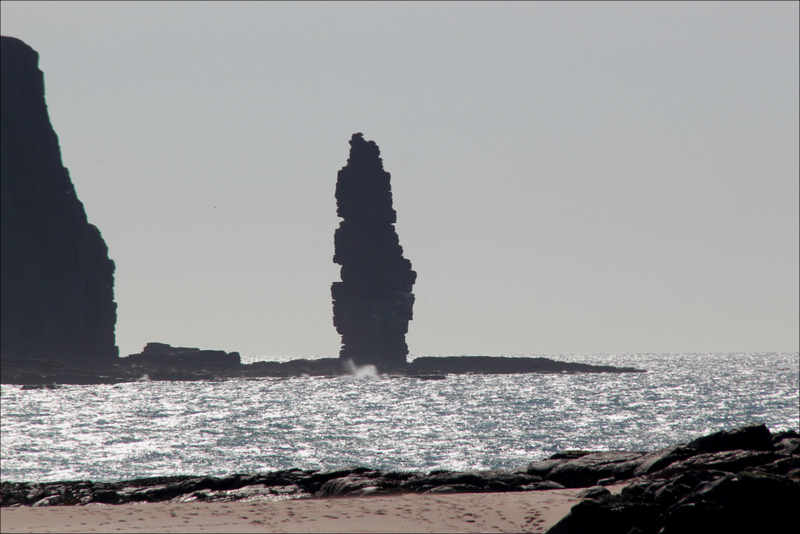 It was great to catch my first glimpse of Am Buachaille, a 65m sea stack located 1 mile south of Sandwood Bay. The easiest ascent, according to UKC, is VS 4c. I eventually almost reached the beach, almost in that I was now atop circa 20m cliffs directly above the beach. This provided a great viewpoint for photos but I had to walk along the cliff top to find a way down. Once onto the beach, it was hard work walking along soft sand but what great views. 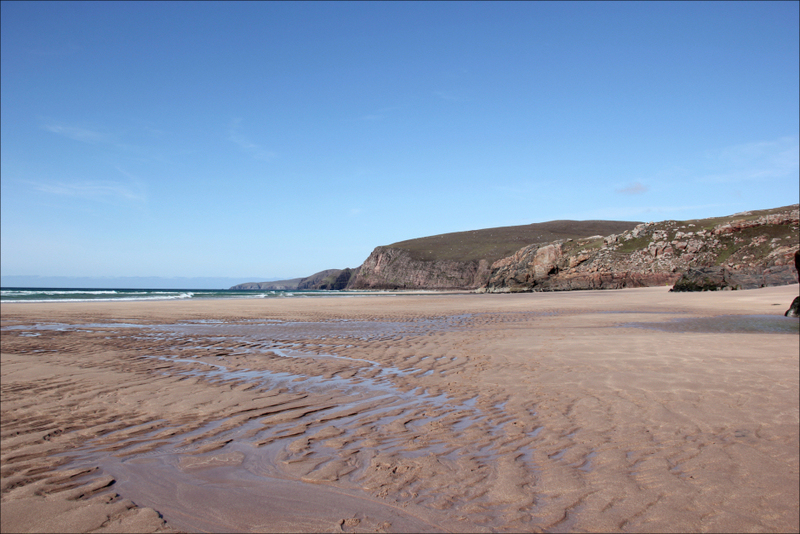 There were numerous people camping next to the beach - lots of people walking the Cape Wrath trail. Am Buachaille looked enticing - what a climb! 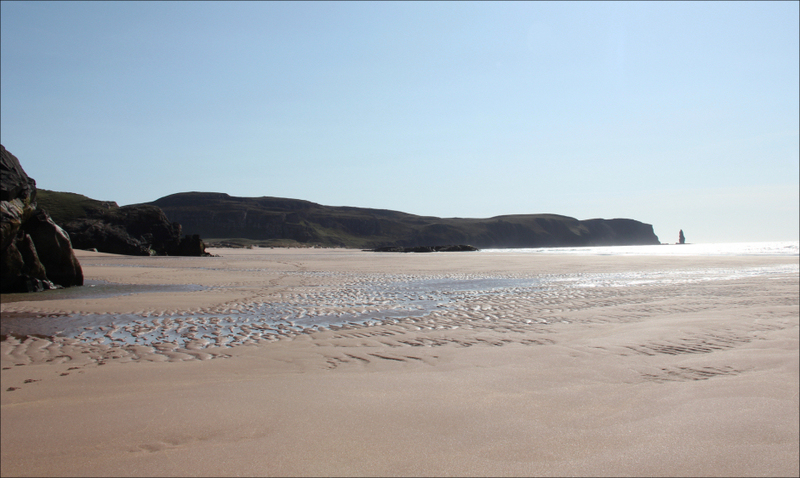 From Sandwood Bay, I now had a circa 6-7km walk out to the car and then a four hour drive home. A really enjoyable day out. 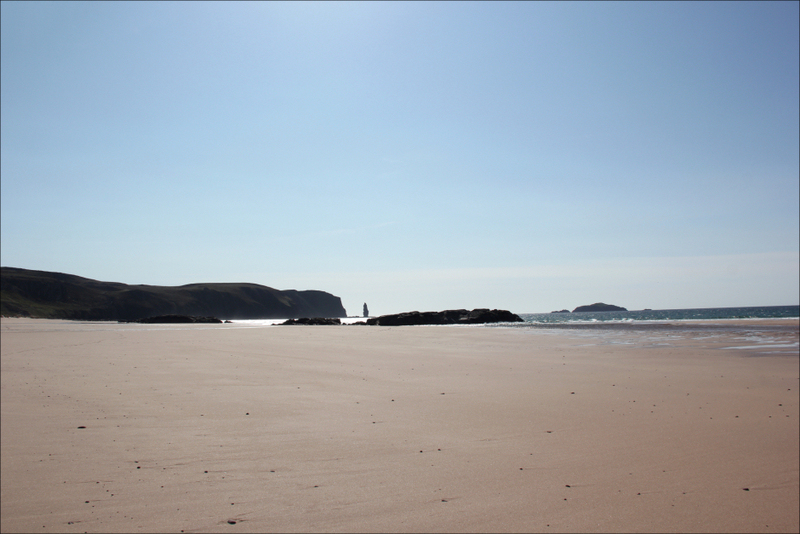 I will definitely be returning to Sandwood Bay in the near future, probably with my tent.